The Eclipse comprises 384 kHz A/D & D/A converters clocked by two independent 64-bit DSP Trinity-level clocks. 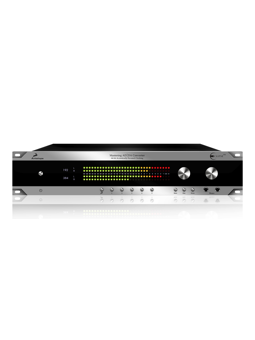 The fully integrated monitor controller employs 0.05 dB accurate gold-plated relay attenuators and provides speaker switching, bass management and cue mix functions with integrated talkback. The Eclipse also includes two dedicated headphone amplifiers and a custom USB interface, as well as two large peak meters on the front panel. The advanced software control panel compatible with both Mac & PC, allows five nameable presets for easy recall of favorite setups. Master clocks are becoming more and more popular for use with digital consoles and recording equipment at concerts and live events. By using the Eclipse 384, a live sound engineer is able to provide sync reference for up to four different devices, while using the main D/A for backing material, the A/D with multiple digital outs feeding redundant recording systems, and monitor DAC to check the recording post A/D conversion. The unique dual-domain clocking system enables analog-based, more natural sounding sample rate conversion. The integrated patching/routing capabilities make monitoring of either analog or digital sources extremely simple, avoiding jitter, distortion and cabling noise. By eliminating the many input and output stages and the various power supplies, that would be present in separate devices, the noise floor can be substantially reduced and the audio quality significantly improved.